We are all familiar with the French Impressionist artist Edgar Degas and his scenes of ballerinas and dancers and of the world of race-courses and jockeys. 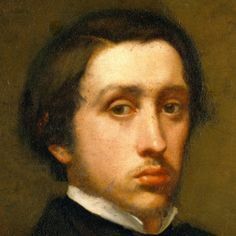 But few are aware that Degas had close ties with Italy, and that he was greatly influenced by Italian art and artists, especially the Tuscan Impressionist artists of the Macchiaioli School working in Florence in the 1850s-60s, whom he befriended during one of his frequent visits to Italy. Moreover, Edgar’s grandfather, a wealthy international banker, had transferred his family from Paris after the outbreak of the French Revolution, in 1789, to Naples, where Edgar’s father was born. His grandfather owned a splendid Palazzo in Spaccanapoli and a villa at Capodimonte. It was in Naples that Degas made some of his earliest sketches and drawings; and he was instinctively drawn to Italian art. He began copying works by the Italian Masters, especially Da Vinci, Botticelli and Mantegna, in the Louvre. Edgar visited Italy yearly from 1854 to 1886, except for 1872-3, when he visited America, where he painted the Office of the Musson Cotton Traders in New Orleans. He spent three productive years in Italy from 1856-58, first in Naples, where he painted his grandfather’s portrait, views from his villa and Vesuvius, and then in Rome, copying works by Bronzino and other Italian Masters, and sketching members of the Roman working classes. Then, travelling via Orte, Orvieto, Perugia and Assisi (to see Giotto’s frescoes), he arrived in Florence. Besides finding inspiration in the Uffizi, it was in Florence that Degas met the Macchiaioli School. They encouraged Degas to paint plein air subjects realistically and to explore the close relationship between man and horse. This instilled in Degas a life-long love of horses, and inspired his celebrated paintings and drawings of race-course life. Italy, especially Naples, held a special place for Degas; and Italy, and Italian culture, particularly the art of the Macchiaioli, were formative influences on him. This lecture, containing new research on Degas, will be accompanied by illustrations of some of Degas’ most important work. Dr Denis V Reidy has had a life-long interest in nineteenth-century culture, especially Anglo-Italian relations. He graduated in Italian and French from Leeds University, where he was awarded the Lucy Whitmell Prize. He then taught at Leeds University, and was a Lecturer in Italian Language at the University of Sheffield. In 1975, he was appointed Head of the Italian and Modern Greek Collections at the British Library, and was responsible for organizing many exhibitions, including on Sir Anthony Panizzi 1789-1879, The Italian Book 1465-1800, and The British Library’s Italian Collections. After completing an MA on The Influences of Boethius’ Consolation of Philosophy on Dante’s Convivio at Birkbeck College, he was made an Associate Fellow of the Institute of Advanced Studies, London, where he lectures on Italian printing. He was awarded a PhD from the Royal Holloway in 2015. He has published nine books, and over one hundred articles in scholarly and peer reviewed journals, and has delivered more than one hundred lectures at universities including Oxford, London, Milan, Reggio Emilia, Bologna, Florence, Rome, Caracas and Istanbul. In 2017, Denis was awarded the Premio Barone Carlo Poerio con medaglia del Presidente della Repubblica Italiana at a ceremony in Naples in recognition of his contribution to research on Anglo-Italian relations, and especially for his publications on Italian Risorgimento history. This is a popular event and early booking is recommended. In case of a waiting list, priorities will be given to BIS members. Only one guest per member allowed.